John Nagel is SJC's primary product engineer. He not only customizes his competition firearms and designs accessories for that winning edge, he also shoots them at the highest levels of competition. John has earned his AAA card from IHMSA competitions, earned a master classification from NSSF at the 2013 world match, and he is a member of the 1-Second Club, hitting 3 targets with 5 shots in just 1 second. He has earned Grand Masters classifications in the USPSA/SCSA with titles in three divisions including: RFRI (Rimfire Rifle Iron Sights), RFRO (Rimfire Rifle Open Sights), RFPO (Rimfire Pistol Open). 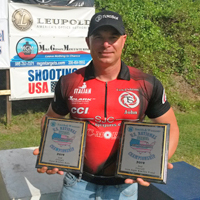 His match success also includes at least 13 NSSF regional wins in 3 separate divisions, 2 silver medals from the 2014 US Steel Nationals and silver medals from two previous NSSF World Championships, plus 2 silver medals received at the Steel Challenge Shooting Association World Championship. He has won 7 world records with rimfire rifle competitions. John has been on the award podium more than 30 times in state, regional and international events. We thank our sponsors for supporting John and SJC in competition and providing match winning platforms and ammunition. Since 1961, we’ve been dedicated to developing and manufacturing self-defense, recreational, hunting, law enforcement, and military ammunition. As one of the largest Rimfire manufacturers in the world, we’re proud to offer a wide array of ammo engineered for reliability and performance. Our ammunition is guaranteed to give shooters that competitive edge. Magnum Research (MRI) is proud to have have sponsored John Nagel, Pro-Shooter for Magnum Research, in the 3rd Annual Copa Aguila 2017 shooting match, held in Guadalajara, Mexico. The Copa Aguila is the largest and most challenging national shooting event in all of Mexico and it draws more than 300 of the very best top shooters from Mexico, the United States, Spain, South America and Europe. Nagel used two custom-made rimfire firearms in pistol and rifle to achieve personal bests in the competition. Magnum Research provided the custom action and patented Ultra-Lite graphite barrels for both pistol and rifle.